SIPRI Director on Armament and Disarmament Dr Sibylle Bauer discusses the future of arms control at the Munich Security Conference. 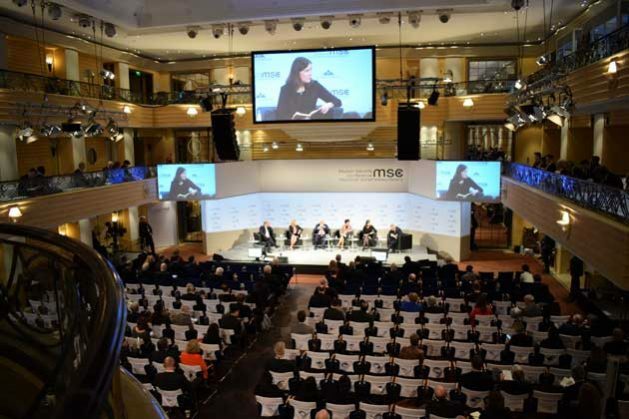 MUNICH, Germany, Feb 20 2019 (IPS) - This year’s Munich Security Conference (the MSC), held on 15-17 February raised many questions but didn’t have the answer. It was not a happy and certainly not a self-confident gathering. Yet a couple of moments suggested the first new blooms of new ways to think about security might soon poke through the soil. That was followed the next year by ‘Boundless Crises, Reckless Spoilers, Helpless Guardians’ – no question-mark this time but not any better or more confident because of that. In February 2017, with the impact of the newly inaugurated Trump administration as yet unclear, it was ‘Post-Truth, Post-West, Post-Order?’. And last year it was ‘To the brink—and back?’, which, if you look hard, at least has a drop of optimism hidden behind the query. This year the theme was ‘The Great Puzzle: Who Will Pick Up the Pieces?’ To make sure everybody got the point, there was a little jigsaw puzzle in the conference packs. But by the end of the gathering, not to anybody’s surprise, there was no real answer. The components of anxiety and uncertainty are not new or surprising for anybody who follows international politics. In the last several years there has been a general deterioration in geopolitical stability. A key dark moment was the Russian takeover in Crimea during February and March 2014 but the problem goes back further than that. In 2009, as Secretary of State in the new Obama administration, Hillary Clinton aimed for a major “reset” in US-Russia relations because of the negative turn they had taken in the previous years. US-Russian relations remain at a low ebb, especially over arms control. The expression “INF Treaty” seemed to be used every other sentence that was uttered at the MSC. It was not like that last year when the prospects for the Intermediate Nuclear Forces Treaty of 1987 was a matter of interest only for the specialists among the specialists. Now people were discussing whether there is any hope at all for nuclear arms control between the US and Russia and what happens if there is none – a new arms race? Or is a more likely prospect perhaps something new, more of an asymmetric nuclear arms competition in which each is spurred by the other’s new systems but not to match them? Along with this, tensions are growing between the rest of NATO and Russia, punctuated by further dark moments such as last year’s novichok poisonings in the UK. There is the trade dispute between the US and China, and close military encounters in the South China Sea where, late last year, US and Chinese warships passed within 40 metres of each other. Beyond the great power rivalries, there is widespread violent conflict and a re-ordering of power in the Middle East. Worldwide, the incidence of armed conflict is much greater than ten years ago. Military spending and arms transfers are at their highest levels since the end of the Cold. Regional rivalries, as between Iran and Saudi Arabia and between India and Pakistan remain heated. There are also rifts and significantly divergent perspectives within NATO. At the MSC, it was instructive to compare the quiet politeness that greeted US Vice-President Pence’s speech with the enthusiastic applause that greeted a single mention of House Speaker Nancy Pelosi’s name. As represented here, the European part of the Euro-Atlantic security community, yearning always for a strong western alliance, seriously does not like the Trump administration. Presumably because they recognised this in their separate ways, those consummate opportunists of the annual MSC platform, Russian Foreign Minister Sergey Lavrov and his Iranian counterpart Javad Zarid, both devoted their time to attacking America, not Europe. A big part of the problem about is that there is not much appetite for a thoroughgoing rethink. For most MSC participants, the answer to the question – “Who will pick up the pieces?” – is, despite Trump, “America, please!” And into what shape should the picked-up pieces be assembled? There were just a couple of moments that suggested something different. One was the first session on climate change and security that the MSC has ever staged in the main conference hall. It is about time. We have got beyond asking whether climate change causes conflict – a dumb question because no conflict has a single cause; the discussion now is about the circumstances in which climate change contributes to insecurity. What starts out as growing human insecurity because of, for example, over-use and inefficient management of water, can translate over time into the open warfare and human catastrophe that is Yemen today. Looking ahead, the discussion needs to address the impact of sea-level rise on low-lying coastal areas. One billion people live less than five metres above current sea-level. What happens to the security agenda ten to fifteen years from now as these areas start to be endangered, if their governments and city authorities cannot help citizens ride out the impact of the change? If nobody else was prepared to confront the bigger picture, Angela Merkel was. The German Chancellor opened her speech by noting that in 2016 geologists confirmed the view that we now live in the Anthropocene Epoch, when human action is the biggest influence upon nature. And this, she said, formed the context in which all discussions of security should be held henceforth. In sum, then: many questions, no satisfying answers, but a couple of glimmers of light showing where to look.